Drs. Kosta J. and Kristen J. Adams, understand that you don’t select a procedure on price alone when you visit a dentist in Sacramento. The doctors spend a lot of time getting to know you and your loved ones, and reviewing your current oral and overall health issues. The information they collect from consultations and examinations helps them identify the best services for your needs, preferences, and goals. Budget is just one of many factors behind their recommendations. 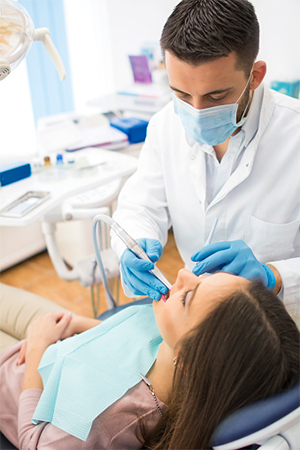 If your needs are extensive, procedures can be completed over several months or years. The dentists work with you to prioritize urgent procedures, so your budget can cover your needs. They also consider your long-term happiness with a given procedure. For example, an inlay or onlay may be a better long-term option than a filling to treat a decayed area. A large filling can threaten the structural integrity of your tooth, which means you may find yourself back at the dentist’s office and possibly for more extensive procedures such as root canal therapy followed by a crown. Also, consider there is significant value in keeping your mouth healthy with the latest and best procedures available. The Centers for Disease Control and Prevention attributes 86 percent of all health care spending to patients who have at least one chronic medical condition. The CDC reports heart disease and stroke, and cancer, diabetes, obesity, and arthritis are among the most common and costly medical conditions. Interestingly, these and many other conditions have been linked in scientific literature to the bacteria and inflammation of periodontitis or advanced gum disease. When you maintain your oral health, you may be avoiding the trauma of these and other illnesses that dramatically affect the quality of your life. Experience Drs. Kosta and Kristen Adams’ consultative approach to care. Call 916-999-1302.